A U.S. intelligence photo of an IL-28 bomber. 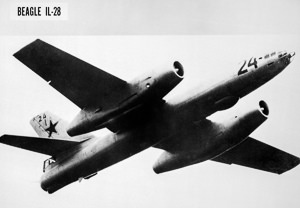 After Khrushchev backed down on October 28, one of the major issues that dominated the next few weeks was the presence of the IL-28 jet bombers. The bombers were old and, by the standards of the day, slow. But they were capable of carrying nuclear gravity bombs, and the southeastern corner of the continental United States was well within their range. The question Kennedy and his advisers faced was how hard to push on the IL-28s. Khrushchev had not mentioned them specifically, so it wasn’t clear if they were included in the deal to remove “the weapons you call offensive,” as Khrushchev put it. For Kennedy, then, that meant deciding how hard to push to get them removed. Kennedy himself was skeptical they were worth risking agreement and had already instructed the U.S. negotiating team in New York not to let the deal get hung up on the issue. But others disagreed. In this clip from the November 1, 1962, ExComm meeting, Secretary of Defense Robert McNamara argues emphatically in favor of insisting that the Il-28s be removed. The context of the discussion is whether or not to run the risk of sending low-level surveillance flights over Cuba immediately so as to see whether the Soviets were still uncrating and assembling the Il-28s. Robert McNamara I think it’s absolutely essential that the IL-28s are part of the deal. I don’t think we could live with the American public if they weren’t. These are bombers with substantial capabilities: 750-mile range, 4,000-pound bomb load. We’ve just got to get those out of there. And we need to know whether there’s any evidence that [the] Soviets are planning to get them out. And if they are planning to get them out, there should be at least an engine removed from a cell, or a tail assembly taken off, or a wing dismantled from a fuselage between Monday and Thursday.